For a long time, I searched endlessly for a piece of personal finance software that fit my needs. We here at The Sweet Setup recommended (and still do recommend) Banktivity as the best app for managing personal finances and budgets, but I didn’t want to stomach its somewhat hefty price tag. There are other great options as well, like Finances 2, YNAB, iFinance, and Mint, but nothing suited my needs or skill set (I work as an accountant by day). About two years ago, I settled on Banktivity and haven’t looked back. Banktivity has just the right set of features for personal finances, whereas higher-end software like Quickbooks is more built for business decision making. 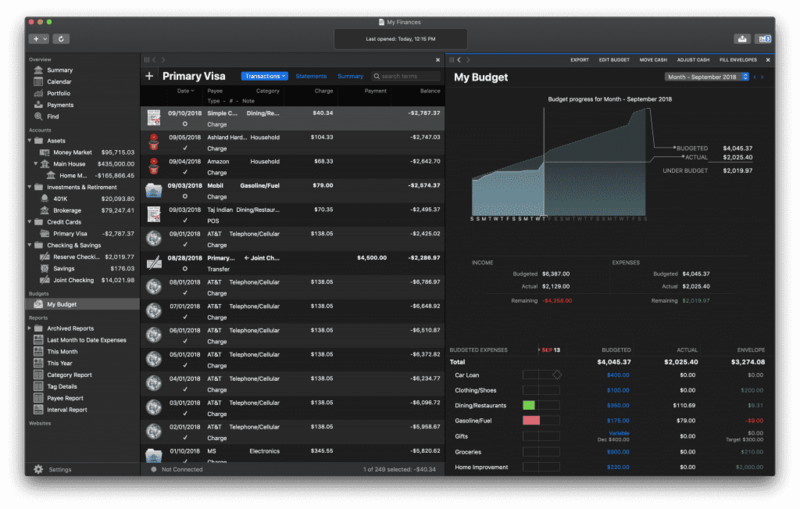 Banktivity’s broad range of features, from portfolio tracking, to budgeting, to general expense tracking, has made it one of the top five most-used apps on the Mac. 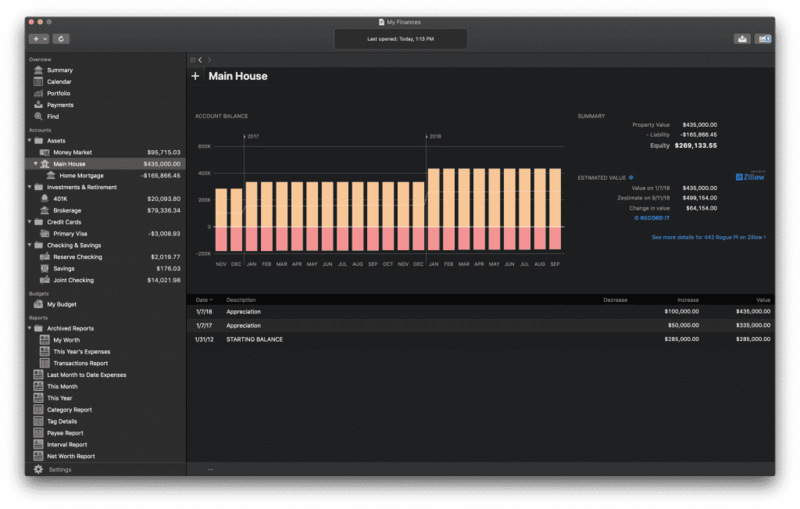 Last week, Banktivity hit version 7, bringing it up to date with the latest features for macOS Mojave. 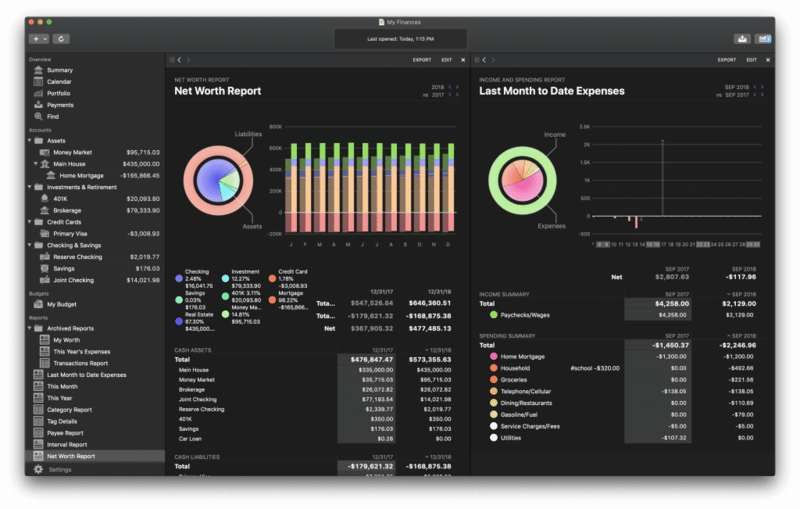 Like every other macOS Mojave debut, Banktivity 7 now sports a stylin’ new dark mode. 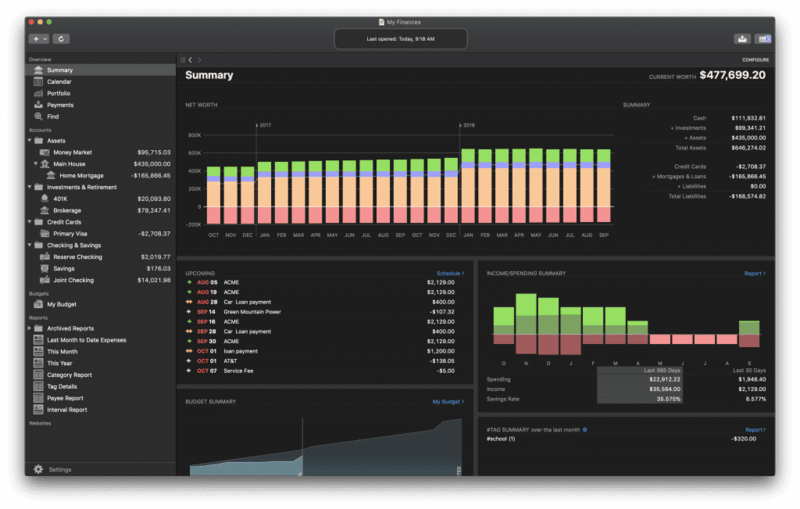 This dark mode design takes most design elements from the system-wide dark mode, but I really like the way graphs and pie charts in reports pop with color. 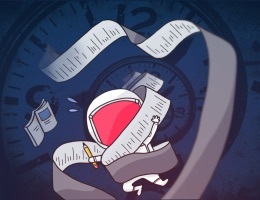 From an accounting perspective, one of the most important elements of any transaction is its timing — dates are essential to effective expense tracking. Banktivity 7 now sports a new calendar view that allows you to pinpoint the timing of each transaction on a large calendar. 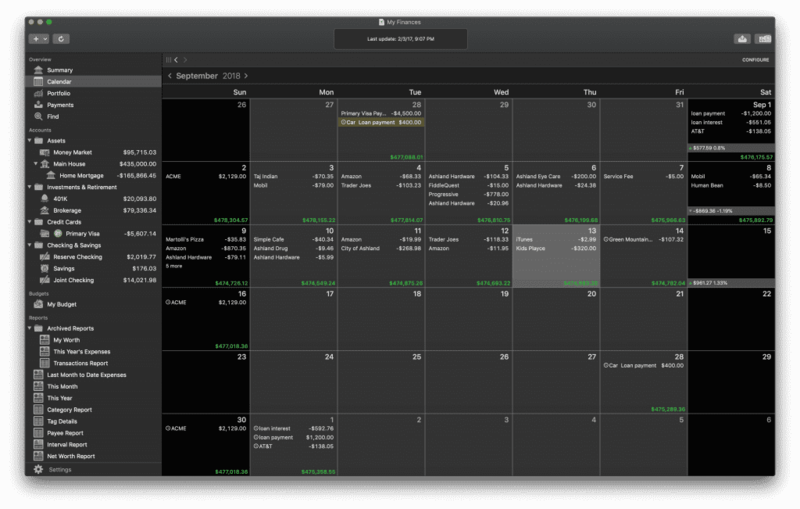 For folks with major recurring bills, this new calendar view will be perfect. However, I feel it could be taken a little further with more color coordination to better denote certain types of transactions more clearly (for instance, investment transactions like dividend income is denoted on the calendar with a pink “Div.” tag). I think general incomes should be one color and expenses another, just to better see your ins and outs throughout the month. The calendar view also tracks your personal net worth at the bottom of each date. Anyone who understands personal net worth understands it shouldn’t be tracked on a daily basis, so this is an odd choice in my opinion. It’s always been relatively easy to track real estate in Banktivity — you could input the original fair market value of your properties and make annual or bi-annual adjustments to the value, crediting some sort of “appreciation” income account in the process. Now, in Banktivity 7, this can all be done automatically. Banktivity 7 includes built-in Zillow real estate tracking. Simply input your home’s address and Zillow will provide a fair market value estimate to better help you understand your equity position in your home. Banktivity 7 also sports a new real estate view, which combines your property with any attached mortgage or lines of credit. This real estate reporting is far superior to any mental math you would have had to perform earlier, let alone attempt to make estimates on your home’s current value. New features like Zillow’s real estate tracking is limited to tracking fair market values in the United States, while the new calendar view will be helpful for specific use cases that don’t fit my needs. 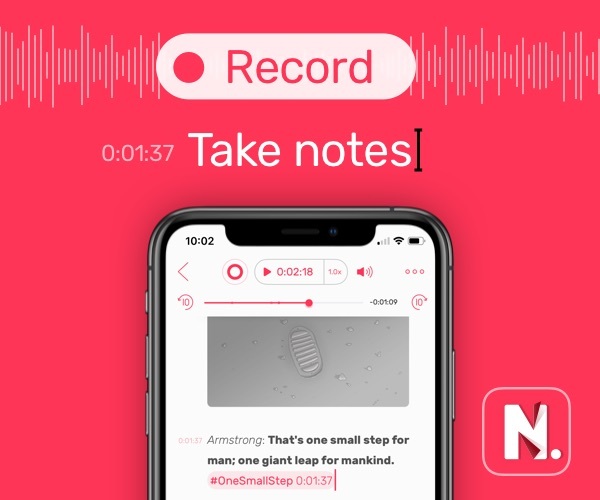 There are a few other new features that I’ve found helpful and help shore up the app to being the ultimate personal finances software available for the Mac. New Account Types: Perhaps my least favorite part of prior Banktivity versions was its relatively short list of account types. 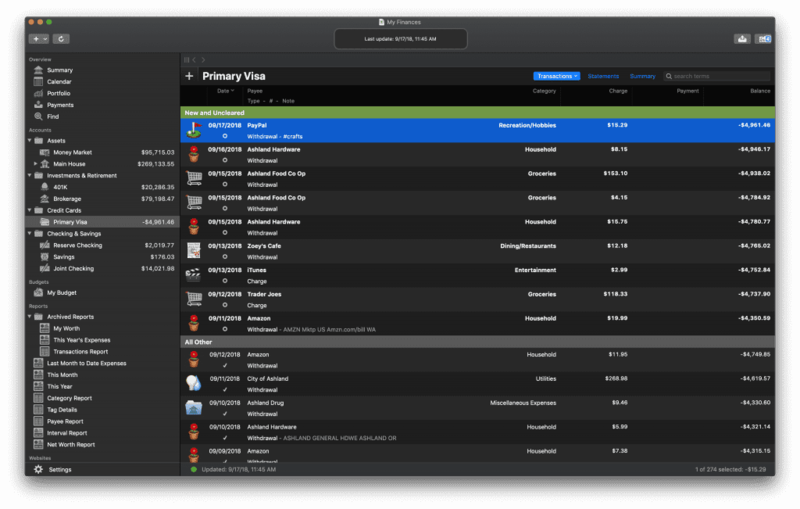 Version 7 offers a range of new options (which are mostly best suited for American users). New account types like “Cash,” “Car,” “Artwork,” “Home Equity Line of Credit,” and “Student Loan” will better suit a wider variety of financial reporting needs. Stock Lot Selection: The biggest reason I use Banktivity over less powerful financial software is due to its portfolio tracking. Banktivity 7 improves portfolio tracking by allowing you to track securities based on each lot. You can now sell from a specific lot, or continue using the first-in-first-out default method. Improved Reconciling: This is best noticed in credit card type accounts, where transactions are completed but only posted and cleared two or three days later. It’s nice to have to separate running balances in your reconciliation to understand the sum of transactions that still need to clear. Customize the Summary View: Not everyone needs a generic set of information in the general summary view, so Banktivity 7 allows users to customize the view to their liking. You can select certain accounts to display in your net worth and better refine the report for your needs. Unfortunately (and unless I’m mistaken), you still can’t remove principal mortgage payments from your year-to-date profit and loss statements. I don’t like seeing principal payments as expenses, as this doesn’t show an accurate representation of the year’s consumed expenses. All in all, Banktivity 7 pushes our pick for the best app for managing personal finances and budgets to an even better level. Banktivity’s ability to directly import transactions should make it easier for folks to keep their books up-to-date (I prefer to input manually), and its relatively easy-to-understand portfolio tracking makes it easy to understand where your investments are at at any given time. Financial systems differ dramatically between countries, so I still wish there was a “Canadian” version of Banktivity 7 (for instance, RRSP, RESP, and LIRA accounts would be great for Canadian users), but Banktivity is flexible enough to handle these types of transactions without out-of-the-box support. Banktivity 5 and 6 owners can upgrade to Banktivity 7 for $34.99, while new users can purchase the new app for $69.99. Be sure to upgrade through your original purchase method — if you originally purchased on the Mac App Store, download the Banktivity 7 free trial from the Mac App Store to access your upgrade pricing.